Holmes Hall was built after the university received funds from the Hatch Act of 1887, which provided federal money for agricultural experiment stations at land grant institutions. Frank Kidder, the architect responsible for Coburn and Wingate halls, designed the building that was initially called “Experiment Station.” At its dedication, it was renamed Holmes Hall. Ezekiel Holmes was an important figure in the early history of the college. As editor of “The Maine Farmer,” he persuaded the public and the Maine Legislature to understand the importance of establishing an agricultural college in the state. He also supported other forms of agricultural education, years before the federal government passed the Morrill Act. It is largely due to Holmes’ influence that the legislature used the Morrill grant money to establish a separate college, rather than giving the funds to Bowdoin to establish an endowed chair. 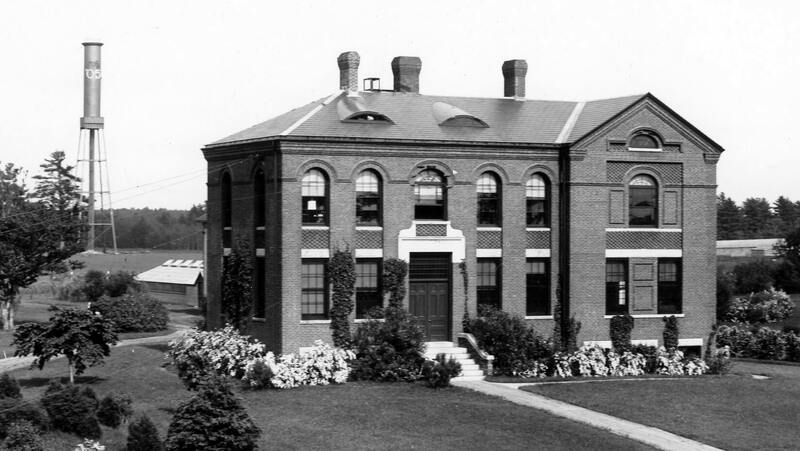 When first constructed, Holmes Hall was a simple brick rectangle, five bays wide by two bays deep, with a one-story ell at the rear (east elevation). The main floor was built several steps above grade so the lower level windows provided ample daylight to make the basement space useable. In 1899, a slightly projecting south wing was added to the building; and in 1904, a symmetrical north wing was added. The two wings greatly enlarged the building and turned it into the most imposing building on campus. A projecting entry, carefully designed to match the materials and detailing of the original building, was added at a later date. In 1955, a utilitarian one-story addition was added to the north side of the building. Holmes Hall became the first dedicated home of the Chemistry Department, and many reminders of that use remain in place. Since chemistry relocated to Aubert Hall in 1914, Holmes had had many occupants and uses. Currently much of the building is vacant while some offices are housed in office and former classroom space.